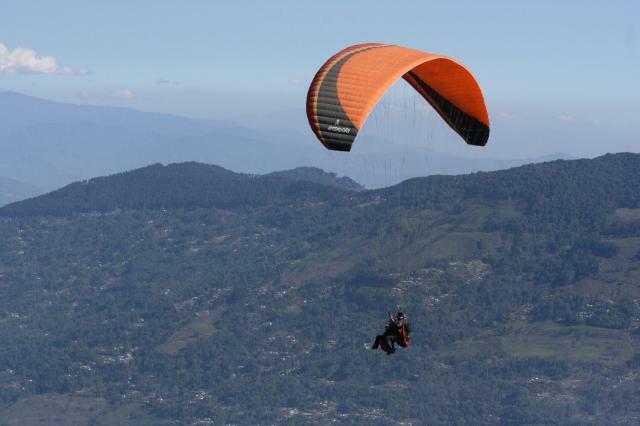 Recently introduced in Darjeeling by the tourism department of West Bengal, Paragliding is a fabulous adventure sport initiative to provide a drive to tourism attracting local as well as foreign tourists in the state. It is life-time experience to get a panoramic view of the Mount Everest, Kanchenjunga peak and the widespread tea gardens over the hills as you soar across the azure skies. The tourists in Darjeeling get a great chance to take pleasure of the breathtaking aerial views of the town with its surrounding mountains. Under the supervision of six trained professionals from Manali all of whom have completed more than 1000 flights, the tourists and interested locals get a thrilling opportunity to enjoy an exquisite, aerial bird eye view of Darjeelingâ��s natural beauty with the wide scattered verdant tea gardens, valleys and the white washed Eastern Himalayan Range with the majestic Kanchenjunga on one side.